The pans were handed over during the staging of the Pan Against Crime programme at the Rose Bank hard court on October 10. The pans were sought by the committee with the aim of re-developing a steel band in the constituency. Government is also assisting with the full execution of the steel band project. Chief Executive Officer (CEO) of SIF, Bentley Browne, told the residents to use the pans to improve cultural activities in the community. He advised the committee to work along with the other newly established steel bands in the country and also the Youlu Pan Movement. He said SIF intended to continue assisting with the management and capacity building of the new steel bands. 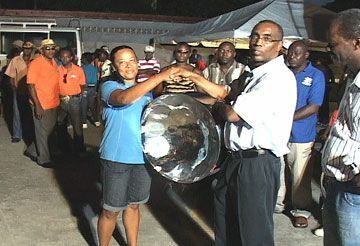 The Northern Stars is the seventh Steel Orchestra to be developed in this country.